This resort in Khao Lak, Phang Nga is located on Sunset Beach and has an outdoor swimming pool and rooms with a private balcony. Free private parking is available. Grand Jomtien Palace Hotel is a short walk from Jomtien Beach in Pattaya. Located 2 kilometres from Pattaya Water Park, it offers outdoor and indoor pools and 8 dining options. Featuring Thai-style rooms situated amidst landscaped grounds, Kata Palm has a spa and 2 outdoor pools that run across the property. It provides parking, beach shuttles and loungers for free. Superb location by the beach in 8 acres of lush tropical garden within walking distance from Patong exciting shopping and nightlife. Magnificient views and stunning tropical sunsets over Patong Beach and the Andaman Sea. Overlooking the Andaman Sea, Tropical Garden Resort is situated along Kata Beach in Phuket. Featuring 2 outdoor pools and 4 dining options, it also houses a spa. Rooms at Tropical Resort are decorated in a modern Thai style. Located along lively Sukhumvit Road, this hotel is a 5-minute walk from Emporium shopping complex and Phrom Phong BTS Skytrain Station. It offers an outdoor pool and Wi-Fi access. St.
Set on a hill, Orchidacea Resort offers views of Andaman Sea and Kata Beach. It provides air-conditioned rooms, a pool and fitness room. Shuttle service to Kata Beach is offered. It is a 5-minute walk to Kata Beach and Kata Village Centre. Surrounded by a tropical garden, Green Park offers an outdoor lagoon pool and a restaurant with 24-hour room service. The resort features accommodation with a private balcony and Wi-Fi access. 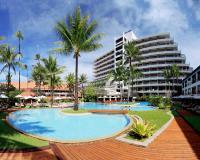 Patong Beach Hotel offers elegant accommodation just 500 metres from Patong Beach and Bangla Night Street. Featuring 2 outdoor pools and a spa, the hotel also has 9 dining options. Situated on Bo Phut Beach, Samui Palm Beach Resort & Royal Wing boasts Koh Samui's largest swimming pool, free shuttle bus services and 3 restaurants. It offers spacious rooms with private balconies. Merlin Hotel is a 5-minute walk from Patong Beach and 1 km from Bangla Road and Jungceylon Shopping Centre. It features 3 outdoor pools, a spa and Thai cooking classes. Patong Merlin Hotel offers modern rooms with a touch of tropical tranquillity.